Supporters of HMLA-169,On behalf of all of the Marines and Sailors of Marine Light Attack Helicopter Squadron 169, I want to thank each and every one of you for your support over the last 6 months. 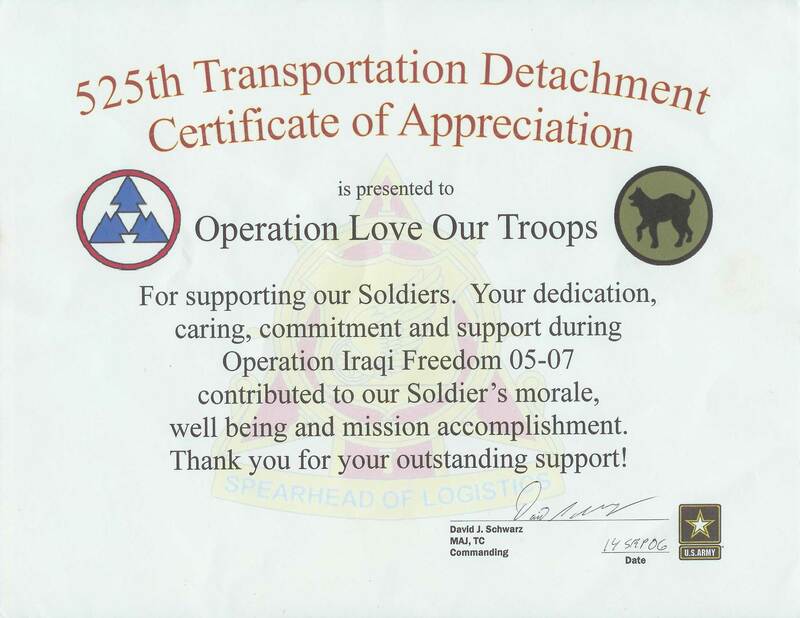 Your letters and packages have made our deployment in support of Operation IRAQI FREEDOM more rewarding and a bit easier, and for this I am eternally grateful. We are approaching the point in our deployment where we should no longer be sent any mail or packages for they will most likely be returned. The day that we are passing to our Marines and Sailors is 15 September. Past this date, there is a good chance that any letter or package that gets sent will be returned, and I do not want anyone to waste money on postage, for I know that postage is a considerable expense. I also want to take a moment to let you know that it has been my honor and privilege to have been the conduit between all of you and the Marines and Sailors of this unit. This has been an extremely rewarding experience in that I was the one who received the credit for your work in bringing a smile to the Marines’ and Sailors’ faces as they: ate a popsicle or snack; read a donated magazine or book; picked out a tube of toothpaste (this saved them a ¼ mile walk each way in the blazing sun); read one of the children’s books to their son or daughter; or received an American flag for doing a job well done. These acts may seem rather mundane, but all of them were either something that improved our Marines’ and Sailors’ lives or reminded them of what we have back in the United States waiting for us. These are very powerful motivational items and we have you to thank! In closing, I want you all to know that it has been my pleasure to correspond with each and every one of you. The letters, packages and emails that were sent were truly inspiring. I have had the privilege to communicate with a wide range of Americans from all across the United States and you all had one common link – undying patriotism! You should all be extremely proud of yourselves – for you have contributed to our nation’s War on Terror. In our modern times, it is not just the men and women in the military that go forward and fight the wars but the men, women and children who stand behind them that are needed to win these wars. We received your packages of snacks and toiletries today from Operation: Love Our Troops and we are very thankful that such appreciative and kind people such as yourselves exist in our world. Our Marines here at HMLA-169 will be very thankful to put these gifts to good use. As you have written in your letter, words often fail us also. The clearest way that I can express our gratitude is to say that the reason we have chosen to be in the military is to protect those in our country who are as thoughtful and generous as yourselves. When you say thank you by sending us packages, we can only respond by saying thank you in return for being the people worthy of being defended. Your gratitude is overwhelming, and ours is in return. On a side note, I grew up in Mastic Beach and graduated from William Floyd HS in 1993. After college upstate, I have lived in many other parts of the country. My mom and step-father still reside on Cypress Drive, not far from the High School. I have been to the post office from which these packages were mailed many times. I personally, am touched to see a reminder of my childhood, in any form. I enjoyed my time growing up in Mastic Beach and enjoy visiting family and friends as often as possible. You wrote in your letter that your sons and daughters are here in Iraq also. If I may ask a favor, please let them know that their service is appreciated even by their fellow service-members. Sometimes, such a small gesture as that can remind us that we are working with the best and the brightest from our country. Once again, thank you very much for being who you are. We would like to thank you for the packages you sent out to us and the other members of the 525th Transportation Detachment. We’re positive that there was something in each box that we all needed, be it a cookie, or flavor of chips that we have not had in a while, the tube of toothpaste to replace the one we squeezed the last possible bit out of or the envelopes and note cards. It is all appreciated. What we don’t use, or don’t want, (some are trying to loose a little weight, so the snacks are out <!–[if !vml]–> <!–[endif]–>will be shared with other Soldiers that we all work with. Again, we appreciate everything you all have done for us. I thank you for your support and generosity through out our deployment. With out it this deployment would be much more difficult. On behalf of my fellow soldiers and myself, I want to say Thank you for your care packages. Everything was much needed here in Iraq. I understand there will be another drive, so please remember our female Soldiers and if possible movies any format. That’s our MWR during off duty. We really appreciate your support. hard to find something new to write about. wanted, however, being a leader is not always the most famed position. country is on the right track. Will having our soldiers here stop terrorist activities world wide? Did we need to be here in the first place? Right now? and on American soil too. I will leave this country a better Soldier, Husband and Dad. Members as we are to our Country. 1SG – Steven – HOOAH !! Hi my name is S H and I have received a couple of Operation Love our Troops packages and I just wanted to thank you from the bottom of my heart. It really makes me feel good to know that so many people care. Sometimes it is hard to keep your head up after hearing all of the negative stuff coming from the states about Iraq, but I am so glad that we have so many people to support us! We are stationed in southern Iraq. And we all really appreciate everything you do for us! Hello my name is Chief petty Officer JRG. I am writing to thank you for your wonderful care package you sent. It was received by our unit Naval Mobile Construction Battalion Five. Our Postal Office received it and it was passed on to our company to pass out to our troops. It was a very welcomed and thoughtful gift for all. To tell you a little about our unit, we are Navy Seabees and we do military construction for all different units. We are based out of Port Hueneme, Ca. We are currently assigned to Camp Arifjian, Kuwait. We are currently constructing all kinds of different things for the Army. It is very busy work and we all enjoy it. Seabees have a proud and rich heritage in construction starting back in WWII. We have been involved in every major conflict since then. When not involved in war time we deploy all around the world and construct anything from water wells in Africa to large building to house a new exchange at all different ports around the world. It is very exciting to know that we are here helping preserve your freedom as well as help those that need it. Our unit at the present moment is composed of Active duty and Reserve Seabees. Out reserve counter part is based out of Lake Hurst, NJ with members form NY, NJ, and PA. I am one of the active duty members. I originally hail form Westbury, NY. I grew up all over Long Island. I joined the Navy back in 1990 and have loved it since. The time that you put in this package makes us proud to serve. We want to again thank you for your thoughts of all of us over here. I just received one of your packages today from your organization. I just want to personally thank you for everything. Your support is greatly appreciated especially through this time of year. As for my self this is my 4th deployment and I can say the support from all the organizations we receive made this deployment the easiest. If you can tell every one that helps with Operation Love Our Troops Thank you for everything they do. Just a short note to let you know your gifts arrived in Iraq, Al Asad to be exact. They could not have arrived at a more opportune time. The Christmas Tree made it the day after Thanksgiving and is already standing awaiting the decorations to be added. Your generosity is humbling as was the note attached to each box. I too am a proud American. I’m proud of our young Marines, Soldiers, Sailors and Airmen serving here in Iraq. I’m also proud of the American people. We are in a difficult position here but there has been no shortage of support from home. Without your support we would be forced to endure the hardships here alone. So, from a grateful Marine my thanks to you for your continued support. Finally as tough as it may be here we do get the news and I am thankful for one last small blessing. When we woke up today no one was trying to beat down our doors or gates looking for Elmos or PS3’s. It is after all the little things that count! Thank you soo much for the boxes. especially being that it is around the holidays. front of a banner that we received. Please accept my sincere thanks for all you have done for me. The packages I received have made my stay here in Kuwait, the best. It makes a Soldier feel great to know that there are Individuals such as you who care. I only wish there were caring people like you, when I spent my time in Vietnam. Again, thank you and all those folks who have helped you to help us. I’m Ryan R. and I’m currently serving in the U.S. Navy but I’m stationed with the U.S. Marines. I’m a Navy Hospital Corpsman. We’re the medical support for Marines and we go and do everywhere they do. I’m serving with 11 other Corpsman that assigned to the various units out here in Iraq. I got this Christmas story from one of my Marines and thought that it just seemed to fit the sentiment of the letter that you wrote in the care boxes. I hope that it helps you see our perspective on how we feel towards our American brothers and sisters that watch over our families and support us so much. Please share this with story with as many people as you can and tell them that their support means more to us than you’ll ever know. the sleet,I can sleep in a foxhole with little to eat. Hello, my name is Dan SPC) H. I have getting packages from you for a little while now. Just wanted to thank you for what you do for us. I know you may not receive many thanks but as you can imagine it’s hard sometimes with everything going on here. Well, I have done my year here. So I am on my way out. I would like you to add a soldier in my place if you would please change my name to SGT C. T. it would be great. He is a good guy that doesn’t get anything from family or friends much. I have to say the Christmas tree was great. I have it in my lil corner. Thank you so much for all the support. The tree was so cute and looks so good in my can. I love Christmas and everything about it. My Uncle Jesse and Auntie M have told me about your group and your sons. Thank you so much for the packages. I love getting mail and being able to share them with my fellow Marines. About me, I have now been in the Marines a little over a year now and really enjoy it. I’m 19 years old and joined right out of high school. I’m deployed to TQ Iraq and I’m in supply. My section sends gear all over Iraq. I found your letter in the Christmas tree you sent at the Red Cross in Balad, Iraq. I have no doubt that the items you sent went to good use by the soldiers who are stationed here at Anaconda. Your dedication to all deployed troops is amazingly generous, considering you have children yourself in Iraq and Afghanistan! I will keep your children in my thoughts and prayers. My name is Cheryl R. I am Commander of a Dental Company in theater. We provide emergency and sustaining dental care to the Soldiers, Airmen, Sailors, and Marines at six different locations in Iraq. The company has more female Soldiers than an average unit in Iraq since we are a Medical Combat Service Support Company. Over 50% of my Soldiers are female. If you would like to send another box, scrap booking supplies would be greatly appreciated. Everyone is taking lots of photo’s, and would like to document our experience in theater. Also a few more of the battery powered small Christmas light sets would help with our Christmas decorating efforts. Again, I cannot express my profound respect for your organization. My name is Spc. I received your card on December 1st. I want to thank you for that. You all mean so much to the troops over here. I saw the picture that was in the card (of OLOT), so I decided that I would put a face to just another name. Thank you very much for the care packages. Your support means a lot to me and my Soldiers. It makes our job much easier knowing that people believe in what we are doing. Freedom is worth fighting for. My platoon is doing very well. We are noticing a change in the attitude of many local nationals here. Things seem to be progressively moving in the right direction. We had a really great Thanksgiving. One of my Soldiers received two small hams in the mail. A few others bought some potatoes and beans from a marketplace. They all combined for one great meal. The day was very relaxing, even though there wasn’t any football to watch. Time seems to be flying by. November went by extremely fast. We are looking forward to Christmas and the New Years. On behalf of my Platoon, I, again, would like to thank you for all of your support. Have a Merry Christmas and Happy New Years. On behalf of men & women of PRG-6, I’d like to express our appreciation for the boxes of goodies that you sent our way. Our service & support people do an outstanding job of keeping us fed, but nothing beats good snacks & junk food from home. Being 9,000 miles away from home it is amazing how much small things like Oreo’s, Almond Joys and the like are appreciated. Thank you all so much. The most appreciated thing in the box was a choice that you all made. Instead of running another errand, taking a trip to a mall, or whatever one chooses to do, Your group chose to take the time to think of us. You choose to spend your valuable time advertising, soliciting, collecting, wrapping & shopping. You could have chosen to do many other things, but you chose to spend your time on our behalf. Thank you for making the choice to support us. We appreciate your generous donation of your time, effort, & energy. You love the troops & the troops love you! It is awesome to be an American!! Thank you so much for everything you are doing. Everything you have sent will be used by all of us. We are eternally thankful and wish we could thank you personally for everything you do for us. I just wanted to say “thank you” on a personal level for your generosity. We do our job because of people like you. Thank you so much for taking your time to think of us over here. I know your packages went very quickly throughout the group that works here. I myself will be able to use a couple things. We stay quite busy and it’s nice to feel like home is over here with us. Again, I and others are very grateful for your time and consider you guys’ part of our family over here. God Bless the four of you, your family and friends. God Bless America, you’re why it’s worth it! Thank you so much for your support, care packages & letters. We appreciate you very much! Merry Christmas & God Bless each of you. I, as well as my team appreciate the package so close to the holidays. We do need this. With everything we see and hear on the news, we were beginning to think America didn’t care about this war or the people fighting it. I understand you have sons & daughters fighting this war also. We pray for them to accomplish their mission and return to you all unharmed. base for injured service members. and will send it to you shortly. I hope you had a Wonderful Winter Holiday. Thank you very much for the overwhelming support your organization has assisted us with. My name is HMCS (EMF) D. W. C. Jr. US Navy. I am the Operations Chief for the Taqaddum Surgical Hospital, Iraq. Your clothing, snacks, toiletries and letters of encouragements have helped our combat wounded patients recover from their injuries. Today we have already had a mass casualty event with seven innocent Iraqi civilians caught in cross fire. Heart-wrenching indeed. I hope 2007 is a year of recovery and healing. they wanted and the New Year’s brings many new memories for all of you. when you finally get the time! tremendous support for our forward deployed forces throughout the world. Just want to send an email of appreciation for the work that you all do. The troops here really appreciate the time that you guys give to make our deployment more bearable. My name is HM3 Liberty L. and I am a Petty Officer is the United States Navy. I arrived on Camp Fallujah about 4 days ago and was struggling to keep my morale above water (so to speak). One of my fellow sisters in the Navy received a care package from Operation Love Our Troops and passed it on to me due to the fact that she is on her way back to the states. When I opened the box and read the letter it brought tears to my eyes. I guess it’s just the fact that people I don’t even know are sending prayers, encouragement, and just basic necessities for life. And because someone shared the box with me, I shared with the other sailors in the clinic I work with. Sometimes troops all over the world feel that America has gotten so complacent in being safe, that the have forgotten about the men and women who are going above and beyond the call to duty. I can honestly say that Operation Love Our Troops have made me proud to be here and serve the people of this great country. It makes leaving friends, family, and loved one almost worth it!! I thank God for you and I will be praying for Him to bless you with everything you need to continue your goals and mission. God Bless You Angels. The care package you sent arrived today, I’m sure it was one of many but this one made it’s way to Al Asad Iraq. Looking at the addresses now I recognize you all as repeated supporters. I just wanted to let you know the package made it. You continued support is always appreciated. We are departing soon but I must say all the support has been wonderful. We have reached that point in the military where everyone has become tired and without the support of the American people this would be a near impossible job. Thanks again for your generosity and staying behind us! I must say that the folks here very much appreciate the time, effort and energy that you have donated to giving us a little slice of home. Please know how heartfelt and sincere our thank you is, as small things from home mean big things so far away. Please pass along our appreciation to all those that work so unselfishly, it is so special…. My sincere wishes for a speedy return of your sons and daughter from this part of the planet. The experience they gain, the stories they will tell and the people that they meet will be a special and fond memories for all of them for the rest of their lives. (I can tell you the names of strangers that communicated with me in 1991’s Desert Storm) I trust that your loved ones will all return home safely and soundly soon. Also know, that despite what the media publishes, we need to be here and take care of these terrorist networks so that our sons, daughters and grandchildren never have to fear their presence. Anyway, thank you all so much for all you do and know that your efforts are appreciated! hello my name is michele s. i don’t know if you remember me but my brother chris is serving in iraq. he recently got a package from support our troops and i was not sure if that was your organization but if is then he wants to thank you very much, and he sharing with his fellow soldiers. he did mention to me that what the guys really enjoy are letters from the children. it really makes them laugh as they read these letters. so if there is anyway we can have some students send letters to him (for him to share) it would really cheer them up. he went to Hobart Elementary school (in case any of the teachers remember him). I am Sgt Z., and want to take a few minutes to say thank you on behalf of my Marines and myself. We all know that you did not have to take the time, or incur the expenses in sending us anything. You all have been great. Sorry if I do not get everything in this email. So with that said, thank you for the magazines, tuna, letters, cards, snacks and support. The weather over here right now is not that bad. It really feels like early spring. I will be asking the Marines if there is any thing that they really need or might like to have soon and will be posting it. Again thank you for everything. Well it’s back to work for me. I just got the Valentine Email and the two boxes of goodies you so graciously sent to me. Thank you very much. I shared the boxes with my Marines. They wanted me to, “Thank you” on their behalf. Can you please thank Molly and Bethany for their beautiful cards they made for us. Our computers were down a little while so I had to write you a letter to thank you for the last box that you sent me. Hopefully you’ll get it in the mail soon. Everything is going well over here. We’ve been a little busy with providing medical attention to some of the Marines we’re supporting but nothing bad. My Marines told me, before we deployed, that I should get used to being bored while we’re deployed. I looked at them weird for a second then caught on to what they meant. For the most part, I have been bored which makes me happy. Have you had the chance to watch the “Flags of Our Fathers” movie or read the book? I read the book a few years back and got to watch the movie not too long ago. As usual the movie didn’t really do the book justice, but it was pretty well made and stayed true to the book. I liked being able to put faces to names even though they’re actors’ faces. When I read the book it gave me a sense of what it meant to be a Hospital Corpsman assigned to a Marine unit and probably influenced me to go serve with the “Green” side. I can honestly say that I have a stronger sense of pride in my job serving with the Marines than I have up until that point. Thank you very much for all of your love and support. I just received your care package. Thank you so much. I have put the items in a common area so that all of the troops and airmen can have access to it. We appreciate your support very much. Your prayers are expecially appreciated, please remember the families of the troops in your prayers. Thank you once again for the box of goodies you sent to those of us deployed. Your continuing generosity is such a morale booster during this time of political turmoil in our country. Knowing we have support from those at home keeps the morale high over here. This letter is unable to express the enormous impact that you ladies and your organization make in the lives of the individuals that you touch. My fellow Marines and I would like to express our sincere gratitude for your kindness and thoughtfulness. We are grateful that there are people like you at home that support us on our mission. Many of us are married and have children and the separation from our families is by far the toughest part of deploying. Getting things from complete strangers, telling us that they are thinking about us and praying for us, means more than you could imagine. Your group is a wonderful organization and will be enjoyed and appreciated so much! Thanks so much Operation Love Our Troops and your whole community for your thoughtfulness and prayers. Thank you for the wonderful package and the thoughtfulness, love and kindness that you put into it. You are all very much appreciated by all of us! I received a package from your group today and wanted to thank you before I got caught up in the hustle here. I am very grateful for organizations such as yours. Many times you are the sole correspondent to many of the Marines here. I am happy you are all thinking of us– we are thinking of all of you and waiting patiently to come home! I wanted to thank you for the care package you sent me and my co-workers. Life is getting better over here day by day. I volunteered to be the absolute last person out so all my junior guys could get home before me. My wife wasn’t too happy to hear that. Boy, did I get an ear full. I was the first to come out and am now the last to leave. The weather sure is miserable over here. About 2 nights ago it was raining down hail big enought to do some damage. I was sleeping when that storm hit. When I got up to go to work there were puddles everywhere. I joked around saying that Minnesota had been picked up and laid out across Iraq with all the “mini-lakes” everywhere. One of the guys returned from R & R and didn’t know about the “lake”. He drove his truck thorough it and got stuck halfway through it. He said he did it at night but he works the day shift. We laughed when we saw him trying to wade through the mud and water. If I would’ve had my camera, I’d have sent it to America’s Funniest Home Videos! I wanted to write and thank you for the Operation: Love Our Troops box of goodies you sent my way. The other fellows and I enjoyed it very much. The days can be quite long out here (much like the movie Groundhog Day). It’s uplifting to get something nice from back home. We appreciate your support.We work in an operations cell coordinating the movement of Marines and cargo throughout central Iraq. It is an interesting and involving job that keeps us on our toes. We tend to act as arbitrators for the various groups we represent and work with. It’s a great team of diverse individuals. We work around the clock to make sure everything happens on time. Several of us are pilots who fly here when time permits. We live and work on Al Asad air base in central Iraq. The living conditions are good and right now the weather is great, much like spring in Arizona. I don’t think anyone here is worried about shoveling any snow. Once again, thank you for your support. We are working hard to get the job done and keep each other safe until we can come home. Your actions remind us of how nice a home we have. P.S. I’m the dashingly handsome one in the uniform with short hair. Thank you so much for the generous Valentine’s Day packages. A special thank-you to Mark, Amber, Juan, Grace Janczyk, Max, Jakyle, and Samantha Descalyo for the beautiful cards. We enjoyed reading them! Everyone enjoyed some part of the packages. We owe and would like to thank all the members of Operation Love Our Troops. May all of you be blessed many times over for your selfless acts! Knowing those back home support us is a real morale booster. 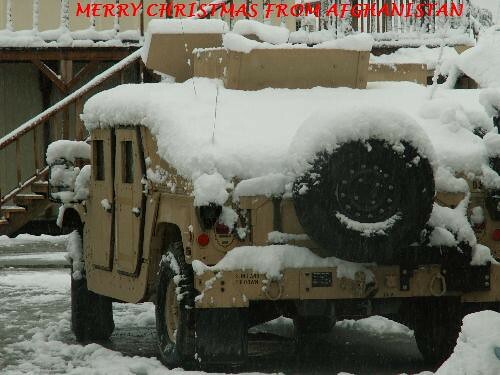 To all the wonderful people at Operation Love Our Troops and so many others that contributed. Every time I receive a letter or package, my faith and belief in people is continually renewed. Sometimes we feel lost in world out here, and thank you for letting me know I am part of a much bigger family. I am a Navy Corpsman. I care for anyone that comes my way in the field, the hospital or our compound and I truly love what I do. Let all your families know, that I pray and wish the best for all who have family over here as well. I wish I could care for everyone! I have shared all you sent with my ragtag bunch! From a very grateful Navy Corpsman, out in Iraq. I just wanted to thank you for the gift box you sent me. My time is up over there and I’m going to be going home. I have enclosed a picture of my crew. I can’t begin to tell you how much your support has meant to us out here and that you’re all doing something great for your country and its Service Members. Thank you very much. I’m leaving your flyer out for the guys that are here now and the ones coming out. May Peace find it’s way to you and your family. I couldn’t have asked for a better group to work with and better group to support us. First and foremost I would like to thank you for all the support and contributions that you all have sent. 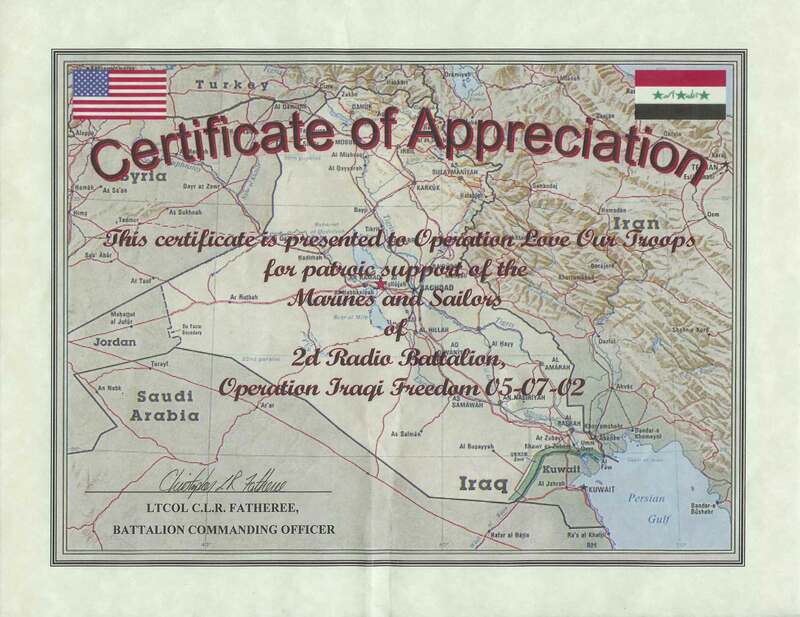 My name is LTJG Mark A. L, and I am a part of the crew that relieved CDR Julia Buck’s group at Al Taqqadum Iraq. She has given me the privilege to continue correspondence with all the generous supporters who have contributed so much to our wounded American and Iraqi nationals that come through our door. I personally want to thank you for all the support and contributions that you all have sent. There are no words to describe the joy of seeing the expressions of the men and women you have affected. The gratitude they experience as they receive the gifts you all have sent, realizing that a complete stranger cared enough to send them something during their worst of times. There are no medications in my formulary that can mimic that sense of elation for these men and women. It has been a pleasure and privilege to distribute your contributions. We thank you for your continued support. Please feel free to contact me for any comments, questions, or concerns. Again, thank you. I just wanted to say thank you again for the great care packages you have sent us. Each one was greatly appreciated and reminded us that there are a lot of folks back home that truly care about the members of the armed forces that are forward deployed in harms way. It has been a long deployment, but we will soon be returning to our families and friends back home. We can only hope that you can continue to send such great morale boosters to the units that will be replacing us. Thanks again for all your support. My name is LCpl M., I am a Marine with the Marine Air Control Squadron – currently stationed in Al Asad Iraq. I just wanted to extend my greatest gratitude to you and your entire organization. It is great to know that there are people out there working so hard to ensure we have all the things we want and need. And if you could also extend our gratitude to CUB SCOUT PACK 187, especially Zachery B. for his Valentine’s day Card we received. Sorry for not writing sooner, but I have been pretty busy. I received your card and wanted to thank all of you. Yes, I was interviewed at our Camp here in Kuwait, but I did not think it would make the News. I do hope to contact you all and thank you all in Person for all the support you have given me. This will have been my 9th campaign I have been in: 4 Tours of duty in Vietnam, 1 tour in Desert Storm and 4 tours in OEF/OIF. I am about ready to retire. After my graduation of the Academy, I will be obligated to the Army for 2 more years, and then Retirement. That will give me about 36 years of Military Service. When I return, if there is anything I can do for the organization, please do not hesitate to ask me. Thank you very much for your care packages and even more just showing your support for the troops. To have the support of people from home is one of the biggest morale boosters ever. This war has drawn so many opinions out of people both positive and negative but to know that people are thinking pass the war and thinking of the troops help instill the sense of pride we all hold inside for defending our country. On behalf of Charlie Company 3/509 we will like to thank you for your much appreciated packages and all of your support. James made it home for leave. It came as a big surprise. He was a welcomed sight. He’s fit and lean. Talking with him, he sounded up beat about what they have been doing over there in Afghanistan. He doesn’t take the seriousness of their situation lightly. Under the circumstances, he seems to be in a very good frame of mind. Needless to say, he is really glad to be back home and in America. He wanted me to make sure I passed along to everyone how much your letters, cards and Care packages have meant to him and his fellow soldiers. It’s their only link to back home. Nothing sent is ever wasted. The fans and cool ties were a special hit in helping them cope with the heat. The munches and other goodies were a welcomed break from MRE’s and programmed mess hall chow. Your personal prayers and notes were very uplifting and very much appreciated. James will have to return to finish out his tour. The whole situation there is very fluid and subject to change. The Taliban now, is much stronger and aggressive than they were during James 2005 tour. For now, James is home and unwinding with family and friends. On behalf of James and our family, I wish to thank you all, so very much, for your prayers and support. I wish you all a happy and healthy day.